Promotional graphic for Katy Perry Cares passes at KAABOO Del Mar. Tickets to a Katy Perry concert can cost thousands of dollars, but when the 33-year-old pop superstar appears at KAABOO Del Mar in September, fans can see her for $98.95. 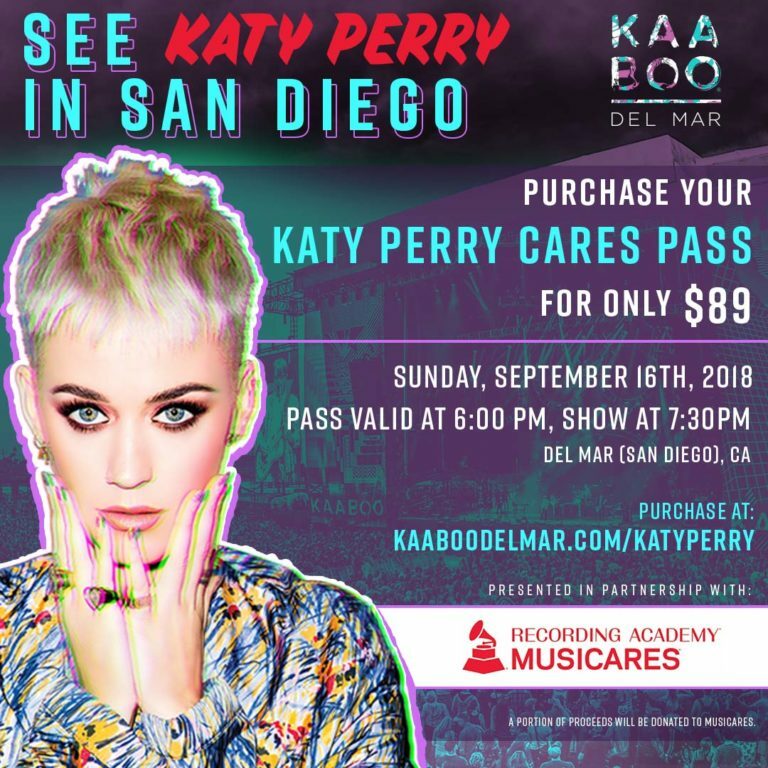 Thanks to a partnership with MusiCares, a Katy Perry Cares Pass for $89 (plus a nearly $10 fee) is being offered for a portion of the three-day event at the Del Mar Fairgrounds. Those passes went on sale Monday. As of noon Tuesday, the website still had passes available. The pass allows entry into the festival starting at 6 p.m. Sunday, Sept. 16, for only the Perry concert at 7:30 p.m. at the Sunset Cliffs Stage. Access is listed as the same as that allowed “Hang Loose” pass buyers — the lowest cost for KAABOO Del Mar. Sunday’s pass at that rate costs $175. But John Gastaldo, a former San Diego Union-Tribune photographer who has attended KAABOO, wasn’t optimistic about fans getting near the singer via the low-cost pass. Those entering the fairgrounds at 6 p.m. would have “not one chance” of seeing Perry on stage, “unless you bring stilts,” Gastaldo said on Facebook. The Sept. 14–16, 2018, festival also features Foo Fighters, Imagine Dragons, Robert Plant and the Sensational Space Shifters, Halsey and Post Malone. KAABOO says its charitable giving program, KAABOO KINDNESS, was established in 2015. “The KAABOO KINDNESS program continues to support charities in the San Diego region and across the globe,” it said. “A portion of proceeds … is donated to featured charitable partners including global partner The Recording Academy’s MusiCares program, as well as three local charities … the San Diego Armed Services YMCA, Surfrider – San Diego Chapter, and Voices for Children.